The news that President Obama will cut off aid to our ally Honduras did not make many headlines this week but it should have. 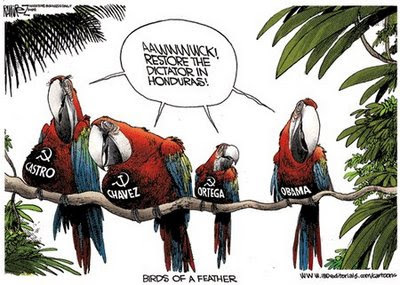 Barack Obama is openly siding with Marxists Raul Castro, Hugo Chavez and Daniel Ortega in punishing the government of Honduras. Not only that but Obama misread the laws to come to his conclusion. The Obama Administration is about to cut off humanitarian aid to Honduras, one of the poorest countries in the Western Hemisphere. Earlier, the Obama Administration blocked travel to the United States by the people of Honduras. Both actions are foolish responses to a recent ruling by the supreme court of Honduras refusing to approve the return to power of the country’s bullying ex-president and would-be dictator, Mel Zelaya. Zelaya was earlier arrested by soldiers acting on orders of the Honduras Supreme Court, replaced by his country’s Congress with a civilian successor, and forced into exile. Zelaya’s removal came after he systematically abused his powers: he sought to circumvent constitutional term limits, used mobs to intimidate his critics, threatened public employees with termination if they refused to help him violate the Constitution, engaged in massive corruption, illegally cut off public funds to local governments whose leaders refused to back his quest for more power, denied basic government services to his critics, refused to enforce dozens of laws passed by Congress, and spent the country into virtual bankruptcy, refusing to submit a budget so that he could illegally spend public funds on his cronies. State Department lawyers, who are not experts on Honduran law, plan to declare the ex-president’s removal a “military coup” to justify cutting off aid, even though Honduras has a civilian president, and the ex-president was lawfully removed from office (although his subsequent exile may technically have violated Honduran law). The ex-president’s removal was perfectly constitutional, say many lawyers and foreign policy experts, including attorneys Octavio Sanchez, Miguel Estrada, and Dan Miller, former Assistant Secretary of State Kim Holmes, Stanford’s William Ratliff, and the Wall Street Journal’s Mary Anastasia O’Grady. Moreover, the ex-president’s removal was not a “coup” because it was not committed by a “small group,” as the definition of “coup” requires. The removal of Honduras’s president was supported by the entire Honduran Supreme Court, an almost unanimous Honduran Congress, and much of Honduran society. Honduras did not lose its government, but merely replaced one illegitimate part of it: its overbearing president. And his removal from office (as opposed to his subsequent exile) was clearly legally justified.